A new Ipsos MRBI survey published on Thursday, on the eve of the Roscommon-South Leitrim and Dublin South West by-elections, showed that the party is level with Fine Gael on 24% each. In the European elections in May, a breakthrough result for Sinn Fein saw the party win 20% of the vote and gain a European parliament seat in each of the four Irish constituencies. The latest poll indicates a further four percentage point increase in popularity for the party, which has come mainly at the expense of Fianna Fail, who have suffered a five-point decline in their support from 25% to 20%. Welcoming the opinion poll results, Donegal TD and Sinn Fein justice spokesman Padraig MacLaughlin said that despite the party’s increased popularity, its representatives still had “a lot of hard work to do in local communities and in Leinster House [the Dublin parliament]”. The poll has increased pressure on Fianna Fail leader Micheal Martin. Former deputy leader Eamon O’Cuiv said that Fianna Fail, which currently has 19 Dail seats and no TD in Dublin since the 2011 general election, had “some hard choices to make”. He said his party had to examine its strategy to decide if they still follow republican ideals. Mr O’Cuiv claimed the republican vote in Ireland had split between his party and Sinn Fein. Sinn Fein is now the most popular political party in Dublin, mainly in working class areas. It has pledged to abolish property tax and water charges if it enters government after the next general election. 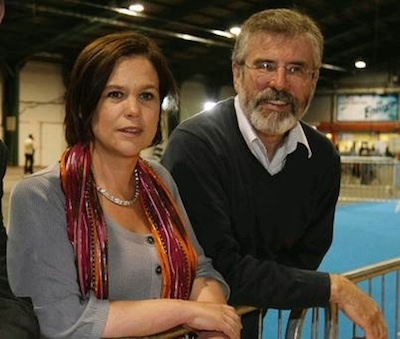 However, socialist activists have attacked Sinn Fein over its efforts to appeal to middle-class voters. Groups such as the Anti-Austerity Alliance and People before Profit have pointed to Sinn Fein’s decision not to support a complete boycott of the water tax, as well as its absence from community protests against the installation of water meters. Sinn Fein’s support in the Six Counties for NI Water, a government-owned water company which is set to implement water charges in the near future, has also been raised repeatedly by its critics. In the Dublin South-West by-election, Paul Murphy of the Anti-Austerity Alliance has campaigned on allegations of Sinn Fein’s ambivalence to ending the water charges. And in a possible turning point, Sinn Fein Vice President Mary Lou McDonald was forced to apologise after Murphy, a former member of the European Parliament, accused her of ‘dirty tricks’ to ensure that the voters of Dublin South West do not elect him. McDonald had reproduced a bogus conversation between a Sinn Fein supporter and someone calling themselves ‘Paul Murphy’, using the same name and photograph as the ex-MEP and by-election candidate. In the faked-up exchange, the individual posing as ‘Paul Murphy’ wrote: “Why am I scared of Sinn Fein? It’s politics Jason. I know Sinn Fein may block water charges if they get elected but I’m not a member of Sinn Fein so politics kicks in and I say what I have to in order to gain support. The fake profile and posting have both been deleted. Sinn Fein’s candidate Cathal King, who is a strong favourite for the seat, said there was no evidence that anyone in the party was behind it, and, if one of them was, they should be expelled. But the controversy could yet deny the party a widely predicted by-election victory, its first since Pearse Doherty won a shock seat in Donegal South-West four years ago. There are 11 candidates in Dublin South West, including four Independent or non-party candidates. The election follows the departure of former junior finance minister and Fine Gael TD Brian Hayes to the European Parliament. Meanwhile, in Roscommon-South Leitrim, ten candidates are standing in the strongly rural constituency to fill the seat vacated by newly-elected independent MEP Luke ‘Ming’ Flanagan, with all the main parties represented as well as six Independent or non-party candidates. The status of the local hospital is the dominant issue here, while a partial ban on turf-cutting is also a significant source of anti-government sentiment. Fianna Fail’s Ivan Connaughton and independent candidate Michael Fitzmaurice are the favourites here. Turnout overall on Friday is understood to have been poor, and possibly as low as 30 per cent in Dublin South-West. Counting begins this [Saturday] morning. A full report on the results will be published here later.